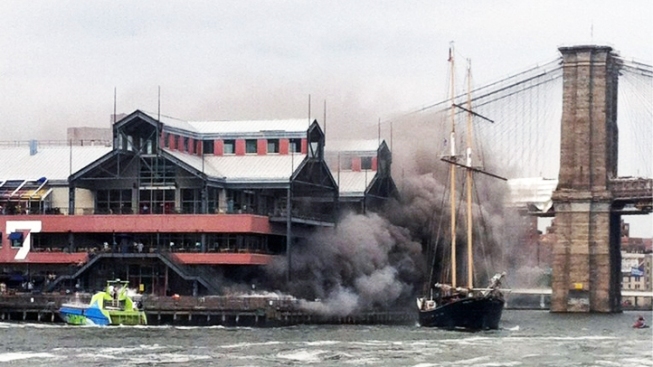 Fire officials say the blaze that engulfed part of a building in New York City's South Street Seaport was caused by faulty electrical wiring. Fire marshals also were checking for any structural damage from Saturday's fire in the tourist-friendly historic neighborhood. The three-alarm fire started before 4 p.m underneath Pier 17 on the East River, covering about 100 square feet, according to officials. FDNY Marine units and divers were dispatched to the scene, as was the U.S Coast Guard. The fire was extinguished in less than two hours, but thick smoke remained in the area, traveling up the East River and into Brooklyn. Fire Department spokesman Jim Long says the blaze "could have been a disaster." The pier was teeming with hundreds of visitors. Fire officials at the scene said the pier's thick wall made it difficult to access the fire, and firefighters had to use chain saws to cut the deck. The fire briefly interrupted the 4Knots Music Festival, which is sponsored by the Village Voice and was being held on another part of the Seaport. A festival spokesperson, Keith Hagan, said the fire was not near their stage, but the music paused temporarily so the Fire Department could conduct their investigation. The show resumed after a 15-minute delay, and continued throughout the night. The pier was reopened to visitors Saturday evening.